Ruby is a dynamic programming language you can use to write anything from simple scripts to games and web applications. It was first released in Japan in 1993, but gained popularity in 2005 as a language for server-side web development. Ruby is designed to be easy to use and fun for beginners, but powerful enough to create complex systems. It's a great choice for beginners and experienced developers alike. While there are many ways to install Ruby on Ubuntu, the easiest method is to use RVM, the Ruby Version Manager. It downloads the latest version of Ruby and installs all of the prerequisite libraries. In this tutorial, you'll set up a Ruby programming environment on your local Linux machine via the command line. Then you'll test your environment out by writing a simple Ruby program. This tutorial will explicitly cover the installation procedures for Ubuntu 16.04, but the general principles apply to any other distribution of Debian Linux. You will need a computer with Ubuntu 16.04 installed, as well as have administrative access to that machine and an internet connection. You'll use the command line to install Ruby. The command line is a non-graphical way to interact with your computer. Instead of clicking buttons with your mouse, you'll type commands as text and receive text-based feedback. The command line, also known as a shell, lets you automate many tasks you do on your computer daily, and is an essential tool for software developers. On Ubuntu 16.04, you can find the Terminal application by clicking on the Ubuntu icon in the upper-left hand corner of your screen and typing “terminal” into the search bar. Click on the Terminal application icon to open it. Alternatively, you can hit the CTRL, ALT, and T keys on your keyboard at the same time to open the Terminal application automatically. If you'd like to get comfortable using the command-line interface, take a look at An Introduction to the Linux Terminal. Now that you have the Terminal running, let's install RVM, which we'll use to install Ruby and all of its prerequisites. RVM automates the process of setting up a Ruby environment on your Ubuntu system. Let's get it installed so we can use it to install Ruby. The quickest way to install Ruby with RVM is to run the installation script hosted on the RVM web site. We'll use curl to download the RVM installation script. Install curl if it's not already installed. This will prompt you for your password to install the program. However, when you type your password, your keystrokes will not display in the Terminal window. This is a security measure and is something you'll see often when prompted for passwords on the command line. Even though you don't see them, your keystrokes are being recorded by the system, so press the ENTER key once you've entered your password, and the program will install. Next, use the curl command to download the RVM installation script from the project's website. The backslash that leads the command ensures that we are using the regular curl command and not any altered, aliased version. The -s or --silent flag mutes curl so that it does not show the progress meter. The -S or --show-error flag ensures that curl shows an error message if it fails. Use the arrow keys to scroll through the file. Use the q key to exit and return to your prompt. The script creates a new directory in your home directory called .rvm. This is where Ruby and all of its related components will be installed, along with the rvm executable program you use to install Ruby. The installation process modifies your .bashrc file to add the .rvm/bin folder to your PATH environment variable so you can run the rvm command easily. This process will download and install Ruby and its components, and make this version of Ruby the default version your system will use. This will avoid conflicts if you have a version of Ruby already installed. If you are missing some important prerequisites, the installer will fetch those prerequisites and install them. It may ask you for your password. Once the script completes, the most recent version of Ruby is installed. In addition to Ruby, RVM installs a few related tools, including irb, the interactive Ruby console, rake, a program that can run automation scripts, and gem, which makes it easy to install and update Ruby libraries you might use in your own projects. Before we can take Ruby out for a spin, let's make one more modification to our system. In order for RVM to automatically use its version of Ruby whenever you open a new Terminal window, your Terminal has to open a login shell, as RVM modifies the .bash_profile file, which is only invoked on login shells. 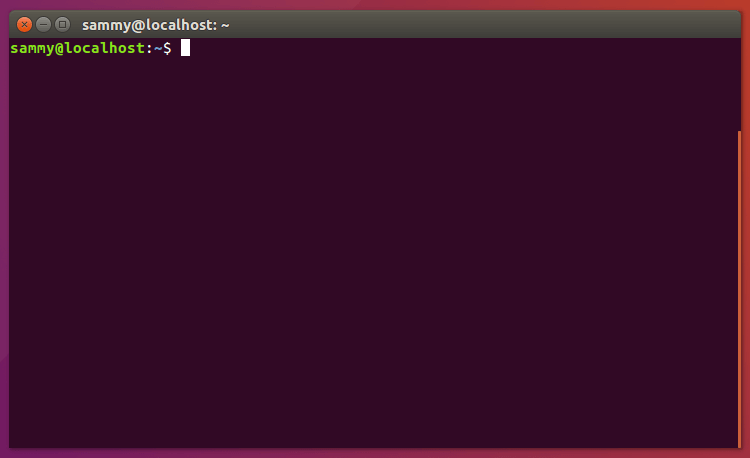 On Ubuntu, the default Terminal opens an interactive shell instead, which doesn't invoke this file. To change this, select the Edit menu in the Terminal, choose Profile Preferences, select the Command tab, and check the box next to Run command as a login shell. If you're uncomfortable making this change, just run the command source ~/.rvm/scripts/rvm every time you launch a new Terminal session. Now that Ruby is installed, let's write a program to ensure everything works. Let's create a simple "Hello, World" program. This will make sure that our environment is working and gets you comfortable creating and running a Ruby program. Exit the editor by pressing CTRL+X. Press Y when prompted to save the file. This simple program proves that you have a working development environment. You can use this environment to continue exploring Ruby and build larger, more interesting projects. With your local machine ready for software development, you can continue to learn more about coding in Ruby by reading the tutorial Creating Your First Ruby Program. This tutorial series will guide you through installing Ruby on your local machine and setting up a programming environment via the command line. Ruby is a dynamic programming language you can use to create anything from simple scripts to complex web applications. In this tutorial, you'll set up a Ruby programming environment on your local macOS machine using Homebrew—a free and open-source package manager for macOS—and you'll test your environment out by writing a simple Ruby program. This tutorial will go over how to set up a Ruby programming environment on your local Windows 10 machine using the command line. You'll configure Bash on Windows, and then use the Ruby Version Manager—better known as RVM, a software platform built to manage multiple Ruby installations—to install the latest version of Ruby and its prerequisites. Then you'll test your environment out by writing a simple Ruby program. In this tutorial, you'll set up a Ruby programming environment on your local Linux machine via the command line. Then you'll test your environment out by writing a simple Ruby program. This tutorial explicitly covers the installation procedures for Ubuntu 16.04, but the general principles should apply to any Debian-based distribution.